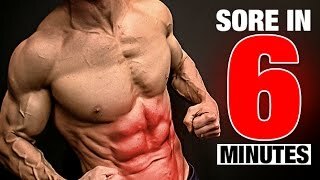 Abs Workout SORE IN 6 MINUTES! 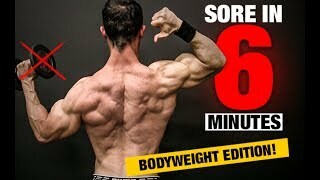 If you are the type that does not get sore from your bicep workout, then you need to see this. 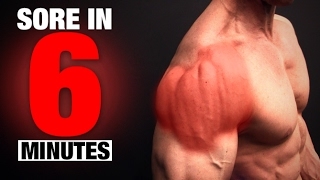 The sore in 6 minutes series continues with the biceps workout edition. 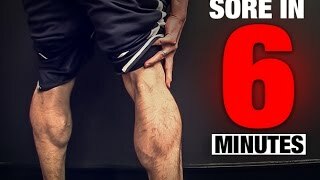 With just one bicep exercise, I’m going to show you how to train your arms hard enough to elicit post workout muscle soreness regardless of how difficult it is for you to do it right now. The biceps exercise used in this workout is the incline variable curl. Choose a dumbbell that represents your 10 rep max on incline bicep curls and perform 5 reps. The key is to lower the dumbbell to a count of 3 seconds and raise it to a count of 1 second. This equals 4 seconds per rep. With each 5 reps completed you should be taking up 20 seconds of time. As soon as you are finished with the incline curl for five reps you sit up and perform 5 seated dumbbell curls using the same tempo and focus on the eccentric contraction. Finally, without resting, lean forward on the bench and perform a leaning drag curl to focus the effort on the contracted range of the bicep curl. Finish with five reps once again. Now, with little to no rest, put down the dumbbells and pick up the next set which should be five pounds less than the ones you were just using. Repeat the entire sequence for the second minute of the workout. 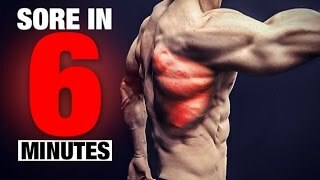 Continue dropping five pounds on the dumbbell weight and performing the same three variations of the incline curl until you have completed five minutes of work. Now comes the icing on the cake. Go back to the original dumbbell weight that you were curling with and pick them up once again. This time you are going to be performing eccentric only repetitions. You can do this by sitting up at the end of the bench and hammer curling the weights to your thighs. From here, act as if you are getting ready to lift the dumbbells up to your chest to begin a set of bench press. This means, use your knees to hike the weights up into position. Instead of pressing them from here however you are going to let them drop down as you lean back into the incline bicep curl position. 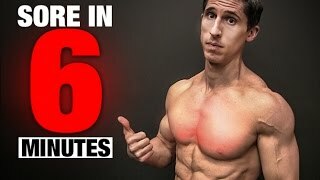 Continue performing these reps for the entire final minute if you are able to. 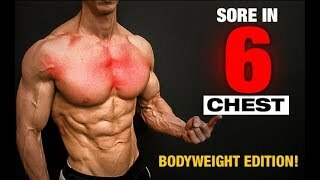 If biceps workout soreness is something that you don’t normally feel, I can guarantee you that this is not going to be a problem after this workout. 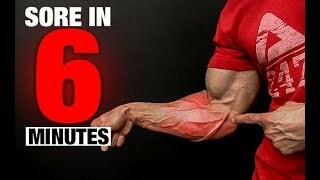 Now, this is just one way to elicit soreness in your biceps during a workout. There are others that can be done equally effectively and, as you know, it is not a requirement for results depending on what the goal of your training is at the moment. If you are looking for a workout program that puts the science back in strength to help you to build not just big biceps but an entirely muscular and athletic body, be sure to head to http://athleanx.com and get the ATHLEAN-X Training System. Start training smarter and the way your body was designed to train and you will be shocked at how much more quickly your muscles will respond.